Mo-Call : Cheap International Mobile Calls with Free Trial Credit | Free Pc to Phone Calls, Free Voip Calls to India International ! If you are looking for cheap mobile voip calls clubbed with really good voice quality and customer support, then Mo-Call is the answer! And since you are reading "Free Pc to Phone Calls" blog, we have something extra for you : free Mo-call trial credit. A lot of people using Skype ask me about various other cheap international calls provider, well Mo-Call is a good Skype alternative. This is not the first time we are blogging about Mo-Call (its obviously one of the best voip provider), but this time you can try Mo-Call for free, with free double trial credit. I am sure you will like Mo-Call and will continue your phone calls with Mo-Call. Mo-Call is a London based voip service provider by Morodo Group. MO-Call was developed by Beijing Morodo Technology Development Co., Ltd. You can read more about Morodo Group on their website. Not taking too much long, and first the procedure to get free trial credit so you can try Mo-Call. Sign up with Mo-Call using this link. Use the coupon code FPPC while registration. You get $2 free trial credit : Worth 100 minutes calls to India. 1. Mo-Call for Mobiles : You simple install one simple application on your mobile, and make cheap international mobile calls. Mo-Call works on almost any phone. When you switch it on, you can route your calls over the Morodo Network to save up to 95% on international calls and SMS compared to your mobile operator. 2. Calls from Fixed Lines Phones : Mo-Call just works like a calling card. Add additional numbers to make MO-Calls from your Home or Office telephone. After dialing the MO-Call access number, dial the international number and the call connects. 3. 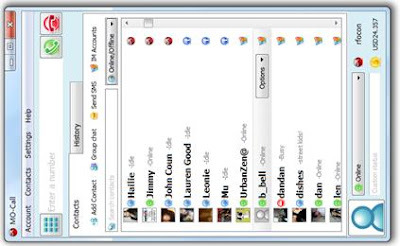 Pc to Phone Calls : Just download one PC application, Voip softphone and start making Pc to Phone Calls. I am sure almost every Free Pc to Phone Calls reader is aware about how to make pc to phone calls. Free calls between connected MO-Callers. Cheap calls to mobiles and Landlines. Cheap SMS to the World. Mo-Call is known for offering very cheap international calling rates. Mo-Call offers cheap calls to so many countries, India, Pakistan, Bangladesh, USA, Canada, UK, Philippines etc. Here's another good thing about Mo-Call. Call billing begins 20 seconds after connection. Calls are charged in 1 minute increments. MO-Call only charges for messages that are confirmed as delivered to the recipient's Mobile Network. So many things have been discussed about Mo-Call. With Promo Code "FPPC" (Free PC to Phone Calls) and this special link, try Mo-Call for free. Please share your views about Mo-Call, your feedback is highly important. Please note : The promo code is only available for users who are from one of the MO-Call Home Countries. Users not from one of the Home Countries are regarded as MO-Call World Country. Users who register from one of the World Countries must make a top-up to receive the additional credit. hi, from kuwait, registered and was told will not get free 2 dollars as not supported in kuwait. Great! How is it different from skype though? Thanks for posting the information too so that I could also compare this to my VOIP. Awesome information. Nice one! Well the first difference is quite evident, just compare the prices of Mo-Call and Skype. Hi, I'm getting an error at the time of registration. At the place Name. it is asking for first and surname. Evnthough i tried in a alot of ways ...i'm still getting error.. Can u help me to solve it..
WiFi phones and inetrnet call dialing offers lots of services, that includes international dialing. However, most of us are easily annoyed of interruptions most especially if the connection is not of great quality. So, i tried browsing the net and found sites that help me point out which provider fits me. Aside from offering cheapest call rates their service is advance, consequently offering services without unexpected and annoying interruptions. I'm calling from America and it is very good. I had trouble only two times out of 15 calls I made. The 2$ credit is also awesome.